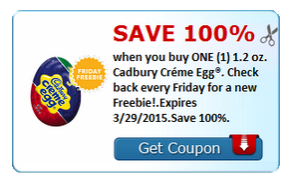 This week CVS has Cadbury Creme eggs on sale with a Buy 1 Get One Free deal (last day is Saturday 3/28/15).. Combine that with the SavingsStar freebie for Cadbury Creme Eggs and you have a freebie deal on your hands. Submit Receipt to SavingsStar for – Save 100% when you buy ONE (1) 1.2 oz. Cadbury Créme Egg®. Check back every Friday for a new Freebie!.Expires 3/29/2015.